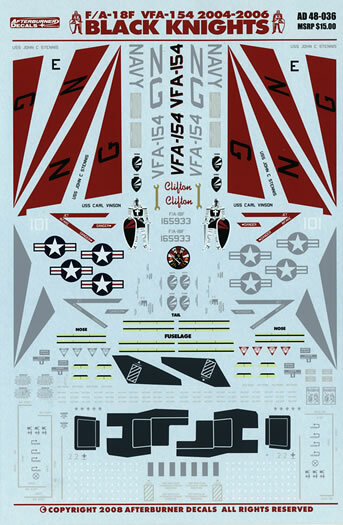 AD 48-036 is the second of the two new releases from the fellows at Afterburner Decals. USS Carl Vinson (CVN 70) between 2004 and 2006. Bureau number 165933, modex 112. A line bird from 2006. No colour with this one and minor changes in the markings layout from the previous option including shorter blazes on her vertical stabilisers and VFA-154 titles replacing the BLACK KNIGHTS ones on her spine. Bureau number 165910. The same aircraft as the first option but as she appeared in 2005. 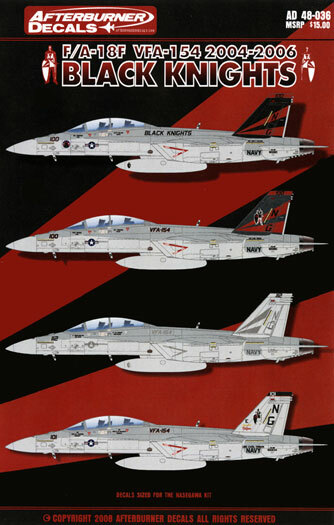 Again, essentially the same markings with the exception of red outlined VFA-154 titles on her spine and the inclusion of the squadron’s Knight (his name is Otis) insignia on the vertical stabiliser. The CVW-9 Shogun marking does not make an appearance and the vertical stabilisers are FS 36081 gunship grey instead of black. Bureau number 165934, modex 101. 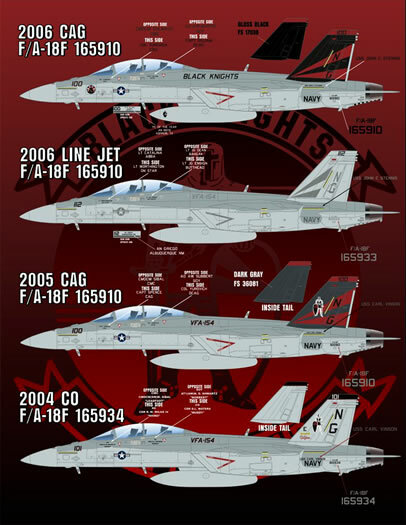 This is VFA-154’s Commanding Officer’s, machine as she was marked in 2004. Basic TPS finish with backed tipped vertical stabilisers (with a thin red chord-wise band), full colour national insignia, stencil data and red outlined 101 modex. Otis makes an appearance on the outside faces of the vertical stabilisers as does a black “Battle E” and Clifton “golden spanner” script and insignia. 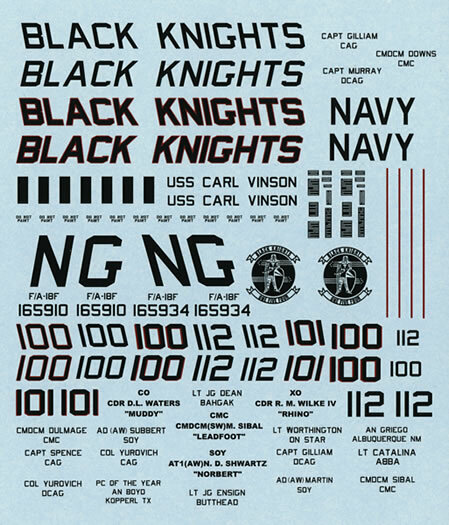 Two sheets of decals are supplied; a normal sized one that carries the vast majority of markings and a smaller one with the black and red markings. 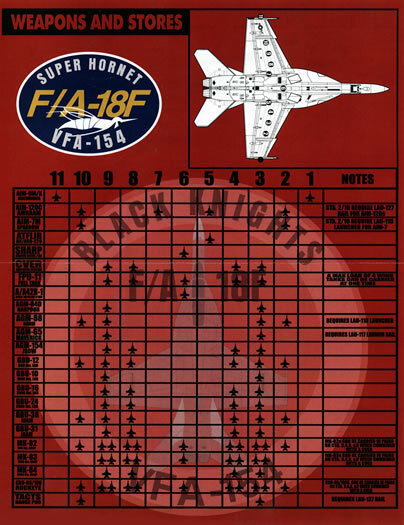 There are two sets of BLACK KNIGHTS titles on this sheet one with a red outline for the first option and a bonus black only set. You also get a pair of alternative style Otis squadron insignia. This latter set is to apply to the vinyl intake covers that can be purchased from Steel Beach. Three sets of “blood stripes” are provided, two in colour and one in lo-viz grey for the second option. Two complete sets of stencil data are provided as well as two sets of national insignia – one in full colour and one in grey. Included amongst the stencil data are sets of white blocks. These are for the inside of the exhaust cones and are quite distinctive on the one-to-one-scale Super Hornets. The decals themselves have been printed by the Cartograf. Everything is crisp, clear and in perfect register. Support material is in the form of two A-4 sized sheets. Included on the first sheet are full colour left hand side profiles of each option as well as a generic upper and lower surface plan views whilst the second sheet shows left and right hand side and upper and lower plan views in black and white to show stencil data placement. 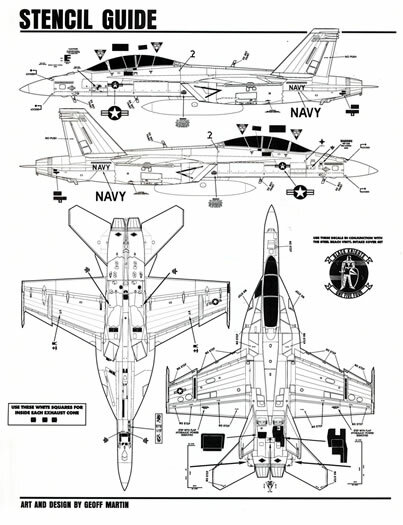 The rear of the sheet carries a weapon and stores “load out” data diagram to assist you in arming your 1/48 scale Super Hornet. The decal sheets and support material come packed in a clear plastic zip-loc bag. 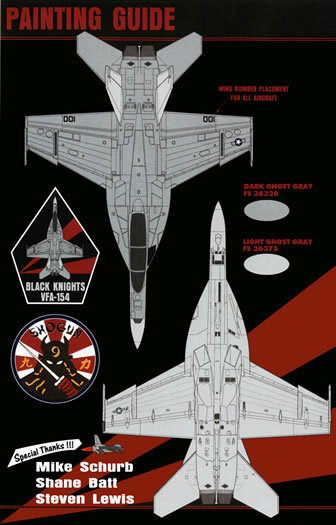 Afterburner Decals continues to provide top quality decals and support materials with this set giving you both bright markings and standard line bird ones that cover a two-year period in the evolution of Black Knights markings. Value for money as far as I am concerned.